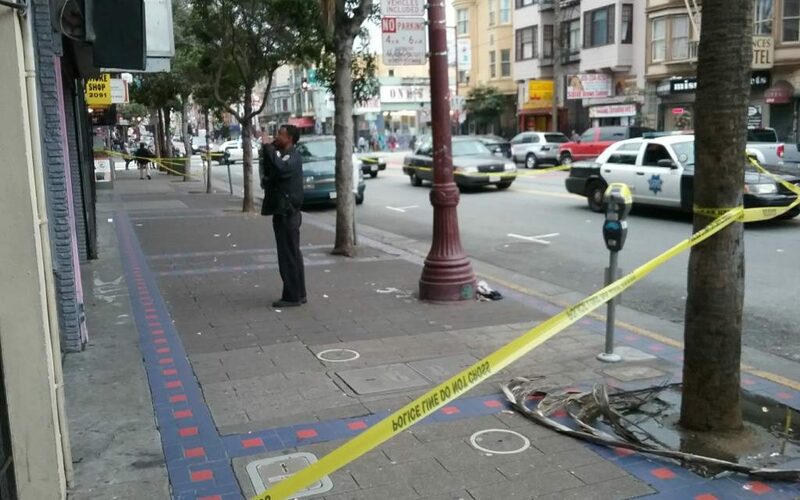 The area of 17th and Mission taped off after the shooting on Monday afternoon. Photo by Joe Eskenazi. San Francisco Police are investigating a shooting that occurred near 17th and Mission on Monday afternoon. Public Information Officer Adam Lobsinger said a call came in around 2:46 p.m. that shots had been fired near 17th and Mission streets. One man was struck and taken to the hospital in a private vehicle. Police had no information on the severity of his injuries. From what I have seen living here in SF all my life… even if Gentrification gets rid of all the poor people, there will always be criminals here trying to make money. Crime will always be part of society no matter what. I mean… look at our Mayor, she’s been trying to get her own brother out of Prison. I can’t see how any small business can survive here with those high rents. pretty soon the streets will be filled with homeless people more than ever.